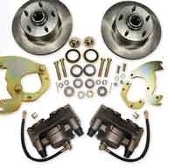 We offer complete power disc brake conversion kits and parts designed specifically for your Pontiac. Our parts are engineered to exacting specifications to ensure easy installation and superior performance. Our brake kits are designed to work with your original spindles, and will allow you to retain your original 14-inch steel wheels if you desire. All of our kits are available in multiple configurations; let us know what you want and we will make it happen for you! All of our kits are proudly assembled in the USA. For expert service please call us at 888-376-0771.